Where The Rainbow Ends - A Rose Is A Rose Is A Rose! From the Cover Blurb: Even the most artistic of imaginings can sometimes seem callow in the face of truth. That which appears may not be and that which lies hidden might just be the stark, naked face of reality. Rahul had everything going his way – a soaring career, a happy family and all else a man his age could yearn for. And then suddenly his life began to crumble all around him, disintegrating element after precious element, leaving him to watch in helpless horror. Where had he gone wrong? Was there still hope for redemption, even a solitary ray that he could cling on to? Avantika, a pretty, vivacious girl who had come into Rahul’s life by pure accident, literally, has suddenly gone missing. Just like that, without as much as a trace. Where is Avantika? Will Rahul be able to find her? Is it her own past that has come back to consume her or is it something even more vicious and sinister? Shalini, Rahul’s first love and a girl accustomed to leading life on her own terms. Hailing from a family that exerts considerable influence in the galleries of politics and power, she certainly has the wherewithal to impact a lot of things. Even lives. Is Shalini fostering a grudge that could displace not one but many lives? Could she be the one behind Avantika’s mysterious disappearance? Review : The book has 200 pages and I read the first 100 pages at one go. It was tough to tear myself from the book but then one has to sleep. In the morning, the first thing that I did was to read up the next 100 pages. Well, that’s the pull of this book. 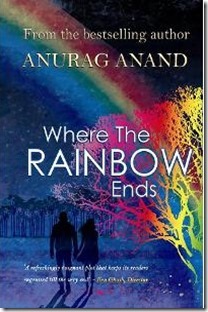 Where The Rainbow Ends is a well crafted story of Rahul, Shalini and Avantika which is set in today’s times. The story is narrated from Rahul’s point of view. The characters are very realistic and so are their trials and tribulations, actions and reactions which makes the story more interesting and believable. Though why Rahul never contacted his family when he was going through a tough time, flummoxed me. The climax is surprising and explosive and neatly wraps the story. The end makes you a bit sad but then it is within the limitations of the story and its setting. The author delivers his story simply, powerfully and movingly. The cover page of the book says that Where The Rainbow Ends is a racy page-turner that promises to take you on a tempestuous and soul-stirring journey which shall remain with you long after you have put the book down, and I agree with this completely. 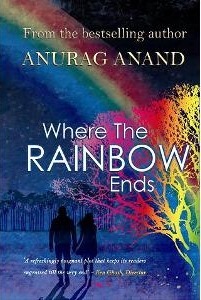 Where The Rainbow Ends is Anurag’s 5th book and I am so looking forward to read his first 4 books now. Linking this post to the Ultimate Blog Challenge and October’s NaBloPoMo. Do share your feedback if and when you are able to get your hands on it. 4.5 is a good rating and your review is also racy. Seems like a good plot for a movie. Makes me want to reach the book. Will do. Sounds like a page turner. Will check if my library has it…it will be next on my reading list. I have never read Anurag Anand before and your review makes it sound so intriguing. My hard luck that you havent read any of my previous works, but am privileged to ‘next’ on your reading list. Do share your feedback once done with the reading. Sounds good! It is a really a nice review. Thank you Rachna… Although i had little role to play in the fabulously worded review (that credit rests with Shilpa), i shall accept the compliment nevertheless! I’m associated with Blackbuck publication and we would like to send copies of our new releases to you for your reviews. Please let us whether you have any email to contact you. Another book on the Wishlist, now ! Looking forward to a nice read ! Look forward to your feedback on the book as well. Sounds like a great book and what recommends it most to me is that you couldn’t put it down. You had to have more! Now that is a great book.